Knightguard Visionline aluminium and polycarbonate roller shutters are the perfect solution for your commercial shop front, shopping centre, shop window, retail outlet, servery, counter, bar, pub, hotel, kitchen, kiosk, cafe and restaurant roller shutter needs. They provide a security barrier while maximising limited space - by rolling up and out of the way they provide an unobstructed passage way when open. The robust aluminium construction of the Knightguard range of roller shutters combined with Visionline's roller shutter curtain made from alternating durable polycarbonate slats interlinked with strong extruded aluminium connecting rods provides a robust barrier with protection and security from intruders, dust and vermin while allowing clear vision through the roller shutter for maximum visibility and light transmission. The compact roll size means Knightguard Visionline will take up less space and be suitable for smaller openings or restricted head room than comparable polycarbonate roller shutter products. Knightguard Visionline roller shutters are easy to use and operate with both manual and a variety of electric control options available. Advanced Shutter Industries has been a manufacturer of roller shutters and roller grilles since 1976 and continues to offer some of the best roller shutter products available in Australia today. Knightguard Visionline polycarbonate roller shutters increase the security of your business and are a visible deterrent to would-be intruders. Knightguard Visionline polycarbonate roller shutters are a barrier to pests, vermin, and dust. Knightguard Visionline polycarbonate roller shutters protect your glass windows and doors from stone damage and vandalism. Knightguard Visionline polycarbonate roller shutters provide protection with full visibility through the roller shutter even when closed. Application and Uses of Knightguard Visionline Polycarbonate Roller Shutters. Knightguard Visionline polycarbonate commercial roller shutters are simple to use and operate with a variety of manual and electric motor controlled lifting mechanisms available, giving you full control over your environment. Operation, opening and closing, locking and unlocking is customised to your needs so you choose how and where you want to open and close your Knightguard Visionline polycarbonate roller shutter, whether it is from the inside, outside, both inside and outside, via keylock, hasp and staple, electric key lock or radio remote control. Standard finish for all visible aluminium components on Knightguard Visionline polycarbonate roller shutters is clear anodised matt finish. Nylon end caps ensure the slats are locked in to place, reduce friction and facilitate smooth operation. Optional punching of polycarbonate slats on all or part of the curtain with cut-outs of 180 mm wide x 55 mm high is available. 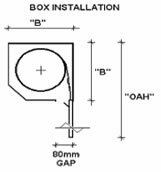 Space between punch-outs is 50 mm apart unless specified otherwise. 3500 mm for manual operation. † For width beyond roller shutter maximum specifications use multiple roller shutters within maximum width with fixed or removable mullions if appropriate. 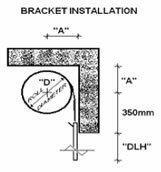 ""B": Pelmet box height and depth.